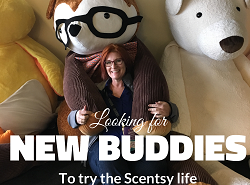 What’s the Real Deal with Scentsy? 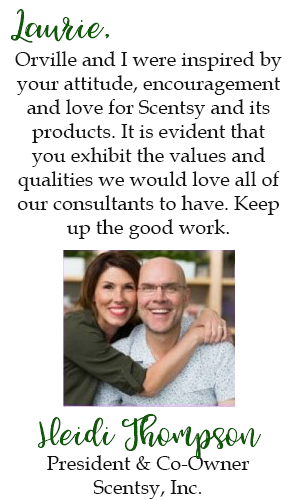 I’ve been with Scentsy thirteen (13) years. I’ve been through a lot with this company. I also don’t pull any punches and tell it like I see it. It saddens me when I read or hear so much inaccurate information about the Scentsy Family – therefore I am going to clear up some myths. Myth #1: Scentsy is just another pyramid scheme and the big wigs are just worried about their bottom line. Truth: Not a pyramid scheme by any means. It’s a direct sales company with a two-tiered compensation plan. Definitely not a pyramid and not a scheme. Read more about a two-tiered pay plan here. As far as just being worried about their bottom line, I certainly disagree wholeheartedly that they are “just” worried about their bottom line but it is indeed important – and that is a GOOD thing. If they’re not in business, if they’re not making money, then we, the independent consultants, don’t have a business and we don’t make money. Myth #2: Scentsy is saturated. I see car decals all over town. [Read more…] about What’s the Real Deal with Scentsy? Can you stand another post about Scentsy Counter Clean? It is one of my all-time, favorite products. I can’t seem to shut up about it. I’m not a neat-freak, or a germaphobe. But I do have two basset hounds, and lots of other messes. I don’t like to live in filth, as I’m sure most of you don’t either. I use Counter Clean on so many surfaces: counters, sink, microwave, stove top, bathtub, floor boards, walls, doors, grout between tiles, inside my vehicle, window sills and dry erase boards. There really are far more places that I use it, than surfaces I don’t. Here is a Before/After picture taken in my hound dogs’ bedroom. This is where one of them eats. With her long ears, she tends to make a mess. I used a paper towel, no brush and didn’t need a lot of elbow grease; it wiped clean. I’m sure I could have gotten it spotless if I used a brush or spent a little more time on it, but considering it’s where my beautiful, smelly, poop-eating basset hound eats, I was delighted to get it looking like it does now, and so quickly and effortlessly. If it looks like the after baseboard isn’t quite clean, those are dings in the wood/paint, not dog grime. Our all-purpose spray cleans while forming a clear barrier on sealed surfaces that gets stronger with regular use. It repels dirt. It comes in a 16 fl oz. spray bottle. It’s ammonia-free; safe for use on granite, counters and bathroom fixtures (and all the other places mentioned above); continuous use makes cleaning easier over time; and it’s available in a variety of Scentsy fragrances. Perhaps you’ll want to use Just Breathe in the bathroom, and Lemon Verbena in the kitchen. Get the most out of Counter Clean by using a lint-free microfiber cloth. I usually just use a paper towel and I’m thrilled with the results; microfiber is an added level of thrill. You might as well order a few bottles, because once you try it, you will love it. Order online here with the Bundle and Save option for extra savings and secure delivery to your door. 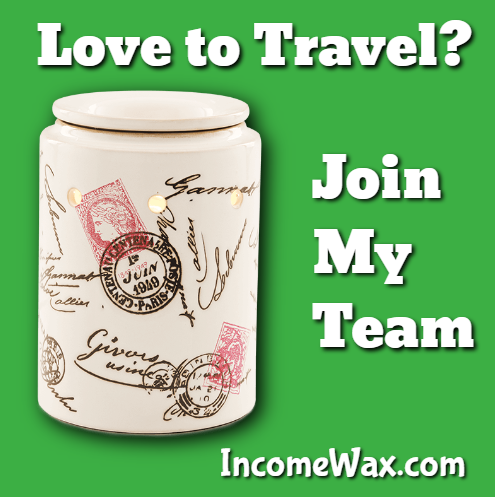 I’d love to have you join my successful international Scentsy team. Click here to start your journey! You and your home can have more than just clean! 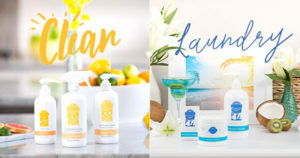 While regular household products might scratch the surface of basic cleaning, our Scentsy Clean and Laundry lines blend elegant, long-lasting fragrance and dirt-dispelling powers into one extraordinary arsenal. From Counter Clean to Laundry Liquid, each high-performance formula is bursting with intoxicating fragrance notes, lending an element of escapism to your everyday chores. No matter what needs cleaning, we have productsto get the job done beautifully.